The Holiday Inn Express Cobb Galleria has Japanese and Mandarin translators on staff to serve the Asian market, complimentary wireless internet in all guest rooms and public areas, complimentary business center with flat screen computers, wireless internet, and copier, new Stay Smart bedding and a new VIP executive floor. The Holiday Inn Express Cobb Galleria is conveniently accessible to both Interstate 75 and 285 at the Cobb Galleria Centre. 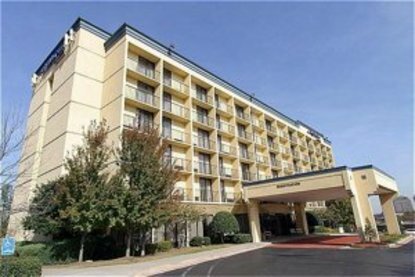 The hotel is within walking distance or a short ride via the hotel's complimentary shuttle to Cumberland Mall, area corporations, casual and fine dining, Historic Vinings Village, golf, Silver Comet Trail, area sports facilities and parks. The Holiday Inn Express Cobb Galleria is a six floor, interior corridor hotel featuring private balconies on floors 2 thru 6, flexible meeting and event space, outdoor pool, spacious parking, fitness center, complimentary Wednesday night manager's reception, guest laundry and valet service, complimentary local calls, complimentary USA Today newspaper. All guest rooms feature in room movies, coffee maker and Smart Roast Coffee, two telephones, full size ironing board and iron, hair dryer and more. Convenience, quality, price/value, exceptional service and a warm, friendly atmosphere is what our guests experience when they Stay Smart at the Holiday Inn Express Cobb Galleria. This hotel is committed to providing accessible facilities under the American Disabilities Act. If your accessibility needs are not met, please contact the Hotel Manager on Duty. Should you require additional information regarding accessible facilities for guests with disabilities, please call 1-800-Holiday (U.S. and Canada) or contact the hotel directly. For the hearing impaired, TDD service is available at 1-800-238-5544 within the U.S. and Canada.